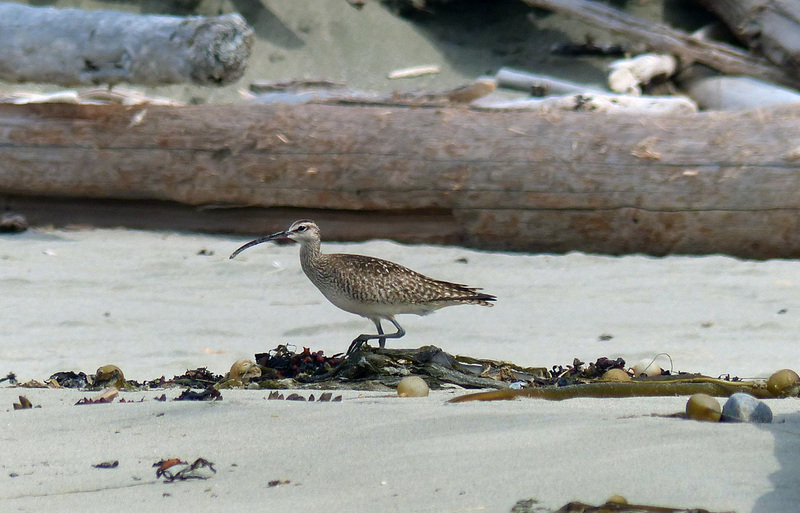 The whimbrel is one of the larger and more distinctive shorebirds found on the Central Coast. Its boldly striped head and long downward-curved bill are key identifying features. It also has long legs, and a long neck that may be curved back on the shoulders or stretched forward. It has a darker back and wings, light front, and streaking over most of the body. Click here to hear the whimbrel's "rolling twitter" call. 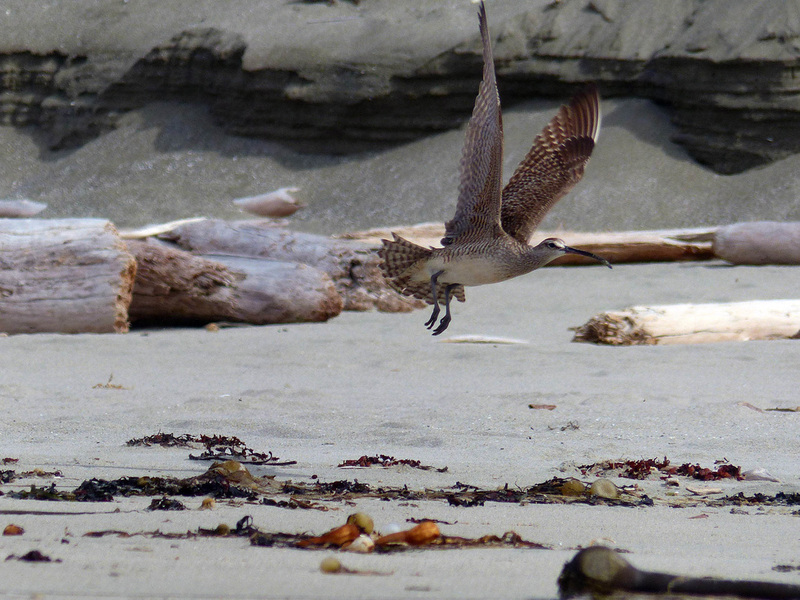 Look for the whimbrel on sandy beaches in winter and during the spring and fall migration months, when it primarily forages for invertebrate prey in coastal areas. During winter it can also be found in other coastal habitats like mangrove forests. During the summer breeding months it nests in a variety of subalpine and tundra habitats, particularly in areas where it can eat nearby berries. This species is found on the coast of BC during migration between its summer breeding grounds in northern North America, and its winter range on the coastlines of South America and the southern United States. It is also found in other areas around the world, including Africa, south Asia, and Australia. The whimbrel and the long-billed curlew look fairly similar. Some key differences are the cinnamon colour under the curlew's wings (visible especially in flight), the curlew's buff-coloured belly, and its extra long bill. The curlew is also missing the whimbrel's distinctive head stripes, which run across the crown of the head and through each eye. 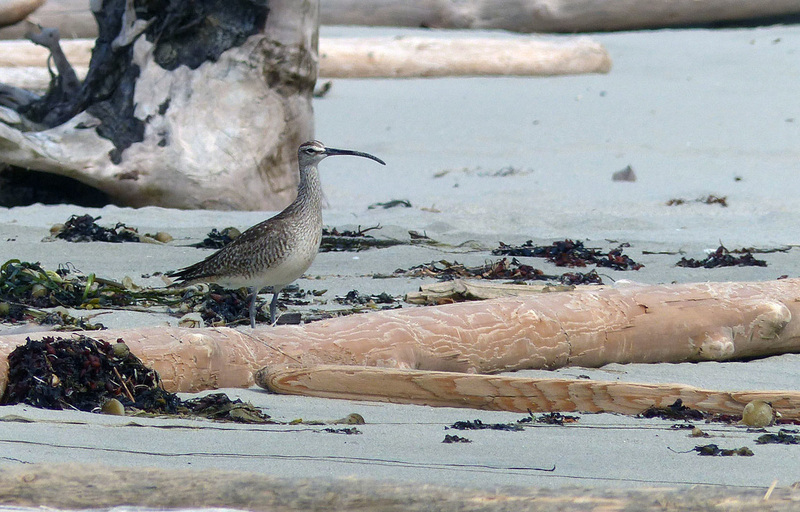 Although whimbrel numbers are still fairly high, they are declining; destruction of coastal wetlands within the species' winter range is a potential threat. Some migrating whimbrels cover 4000 km in a single non-stop flight! There are four whimbrel subspecies. Dunn, J. L. and Alderfer, J. (Eds.). (1999). National Geographic Field Guide to the Birds of North America. (3rd Ed.). Washington, D.C.: National Geographic Society. Pp. 166-167. Whimbrel. The Birds of North America Online (A. Poole, Ed.). Ithaca: Cornell Lab of Ornithology. Retrieved from the Birds of North America Online. Accessed 29/07/2013. Whimbrel (Numenius phaeopus). Audubon WatchList. National Audubon Society. Accessed 29/07/2013.